When the Miami Seaquarium decided to renovate their penguin exhibit, they knew they needed to add a cooling element to make standing in line and viewing penguins in the summer more bearable. Koolfog designed discrete misting nozzles to spray cooling fog around visitors who are waiting in queue. 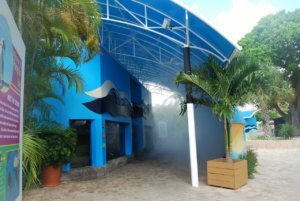 Aquariums and zoos are starting to use misting more and more to keep both animals and visitors comfortable. Misting line can be installed inside or outside an exhibit, or even on walkways and paths. It’s a great way to make an outdoor venue appealing year round, even during the hot summer months.